The Spanish authorities have set about demolishing another foreign-owned home built with consent from the local town hall, this time in Ibiza. As you might expect from an island world-famous for party glamour, the doomed house has a multi-million Euro price tag and belongs to a music celeb. The property, a 3,000 square meter Moroccan-style mansion that took 9 years to build, and is reported to have contained a state-of-the-art recording studio, was built and owned by Michael Cretu, a Rumanian-born French pop musician and producer, best known as the creator of the Enigma project and a producer of some of Mike Oldfield’s songs. Tearing down the property, located in the Ibizan municipality of Sant Antoni, in the North West of the island, is expected to take 3 weeks and cost around 350,000 Euros. The authorities have had to ship in specialist demolition machinery to do the job, which began last week. After years of legal action the Spanish supreme court ruled, in 2003, that the property was illegally built in an area of maximum environmental protection with an illegal building licence, and should be demolished. Even a special law introduced specifically to help Cretu keep his property, passed by a former Balearic Government (run by a corruption-scandal plagued Popular Party administration), was not enough to prevent the demolition order. 6 years have passed since the Supreme Court ruling, and the town hall of San Antonio has been fined twice for failing to enforce the demolition order. Cretu’s lawyer has suggested that the property was only demolished because his client was a foreigner and a celebrity. 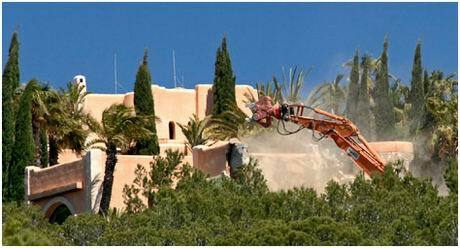 Some local residents told the Spanish press they deplored the cost and demolition of a mansion. In response to the demolition, Cretu is now seeking damages of 18 million Euros. Well its definitely a shame that property gets demolished but then again the law should apply to everyone!